I tried to set my alarm last night. Can't believe how hard it is to get the time straight. I was setting it because I was going to go with Phyllis this AM, she had a Doctor appointment and she was going to drop me off at WalMart to shop alone. She was going to pick me up at 8:20, I set my alarm wrong but I naturally woke up at 7 there time. The coffee started at 5, it woke me up for a minute, but went back to sleep. Jim didn't get up till 8 ish. I drank coffee for a while and took a quick shower, guess that is what woke him up. I took some of my bags along. It was a very nice WalMart. I went down many isles before I even saw anyone. I mainly bought food. I was looking for melamine dinner plates, I have corelle ware plates. I broke one in the FW and it shattered into a million pieces. It is so old and I'm sick of it, and I want it out of here. I had slivers of it under the slides, went everywhere. Anyway they had nothing. I did find Glee at this store, something I have been looking for too, it is Paleo friendly. Did not know it was so pricey though. I didn't get any. I just make my own if I need it, just drain the butter off of the milk solids. I was in the check out line when Phyllis called was on her way. It was all perfect timing. I saw her truck coming, those big dually trucks are hard to miss. We had a nice chat, well both ways. She dropped me off. We are at the end of the driveway near the road. I put everything away. I had my leftover lunch from yesterday, Jim ate the rest of my white chicken chili. Then we went in the house for probably about 3 hours, sat in the living room and talked. It was very enjoyable, so easy talking with these wonderful people. I gave her a cross stitch I made and my Dad made the frames, it is special for me, I wanted to give it to someone I cared about, she seamed to like it, like a house warming gift. I said we should go because I had to start cooking for dinner. 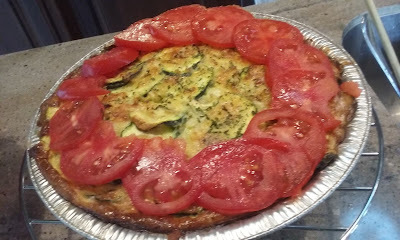 We went home I made a zucchini pie and got that in the oven and a large salad. I also made 4 individual salads for travel days. Back on the road tomorrow, I would love to stay longer. It is so quite, peaceful, and dark at night. I got a mini variety cheesecake at WM for dessert. When everything was ready we walked it over. They grilled pork chops and had green beans. What a wonderful meal. After dinner we cleaned up I loaded the dishwasher. We went for a walk around the property. Then in our truck to play with our built in GPS we don't know what we are doing with it. It does so many things, it is a shame not to us it. We said good night, we will be leaving tomorrow 9ish. They said they would see us then. photo from stock, not actual zucchini pie. This pie was so good. Got to get the recipe. We so enjoyed your time here. Just remember.....I programmed our address in your on-board GPS. No excuses.